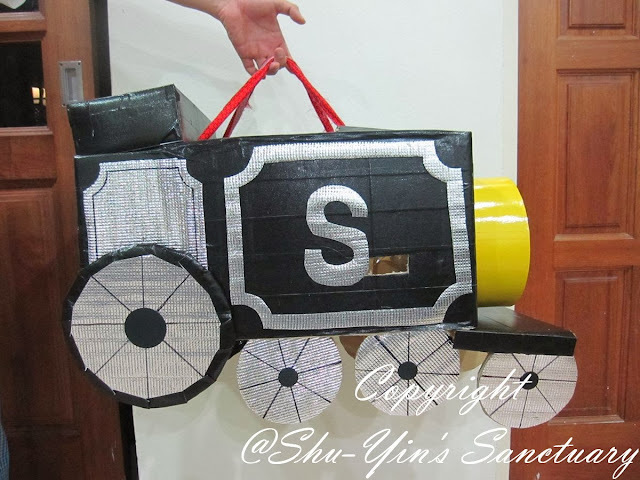 Shu-Yin's Sanctuary: Labour Of Love: Making Of The Train Costume! 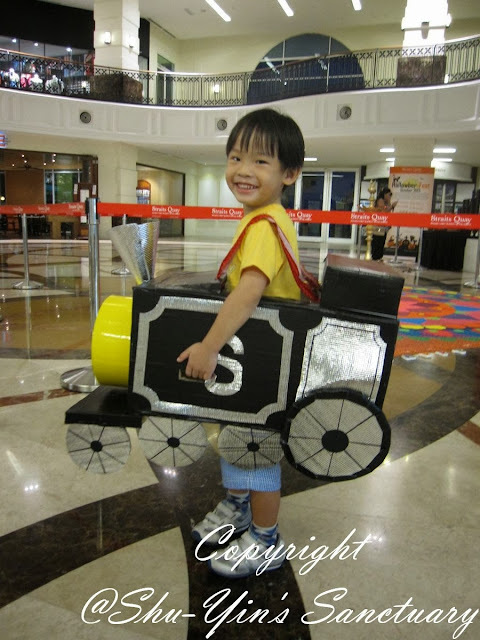 Shern came back a last week from school and told us that he wanted to go to a Halloween Party in Straits Quay. (I'm not sure if he heard this from school or from his friends). I asked him "Do you know what is Halloween?" Shern replied "Halloween is 'trick or treats' and must wear special costume. Some people wear pumpkin clothes or some people wear witch clothes who sweep the floor." Lol. But I was really amused by the answers he gave me. I was sure I knew nothing about Halloween when I was his age. lol. In actual, I didn't like to celebrate Halloween with my kids. Not those celebrations with vampires and ghosts, zombies and draculas and blood. I think it is real scary for small kids. But I am alright with the dressing up part, but with kid-friendly costumes of course. So I asked Shern what would he like to be dressed up in. Well, I was not surprised when he answered "Train". And I was left with like 3 days to the Halloween Trick or Treat function on Sunday! So I googled for ideas and inspirations with stress mode turned on! I spent the next several days (usually after midnight after the kids are asleep) to work on making it. 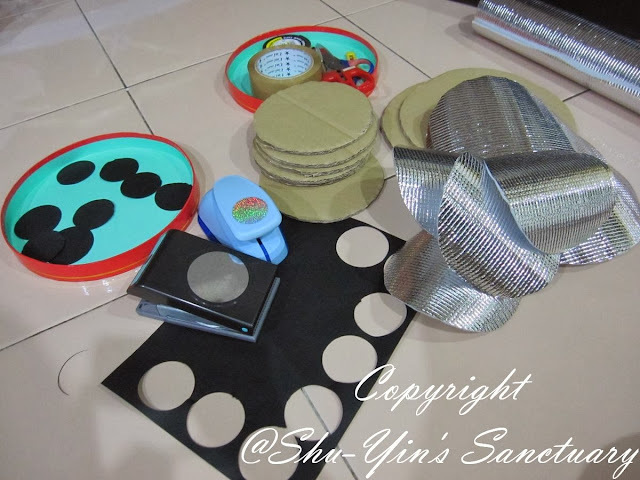 These are the boxes that I kinda found after rummaging my whole house, except for the yellow round box which I got from Daiso. I taped the whole thing using black Cloth Tape (not sure if it is the same as duct tape or not) but somehow it made the train a little bit more waterproof. 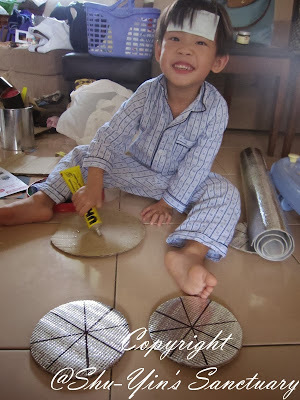 Manually cut big circles for the wheels, and punched out tiny circles for the wheels details. 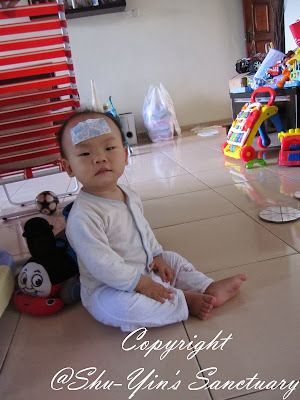 Both boys ended up having fever, but Shern also helped me with some of the steps. Shern glued the wheels under my watchful eyes. 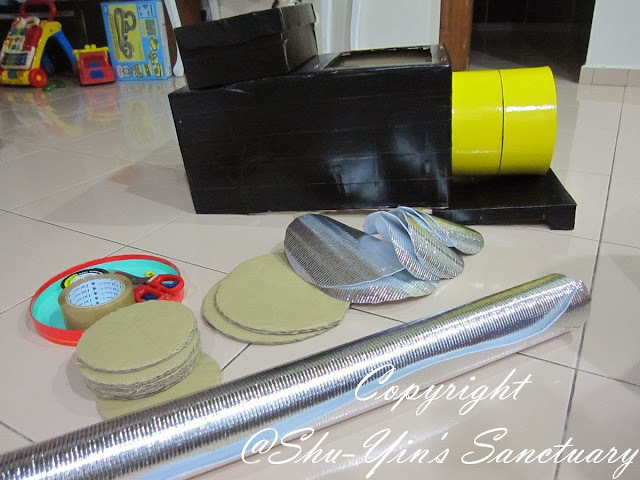 And Khye helped too by throwing the wheels around the house. lol. So yeah, my 2 boys were involved too in making it. My living room was a real mess the few days while I make the train costume. But in the end, there were major problems to the train. I cut the hole not in the centre and thus that made the train tilt to one side. And also the different weight of the train made the tilt worse. So I had to re-think how to salvage it. I ended up re-cut the hole, and making the front of the train shorter, and also changed the shoebox on the back of train to make it lighter. In the end, yay, it balance. No more senget (tilted) train. Phew. I forgot the funnel 'til the last minute. 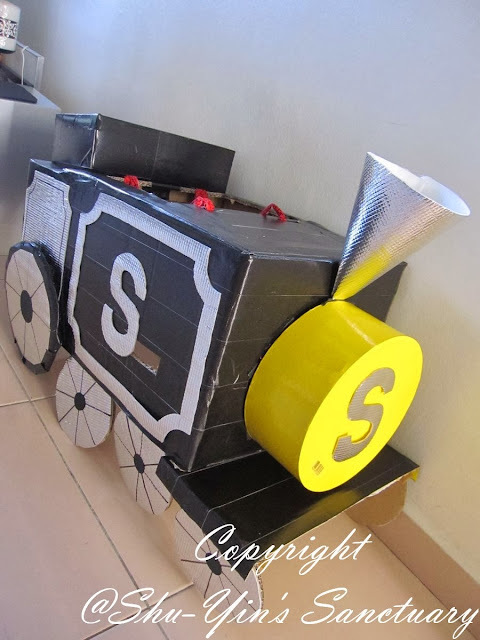 Ok, this is the train with the funnel. Noticed the uneven wheels? 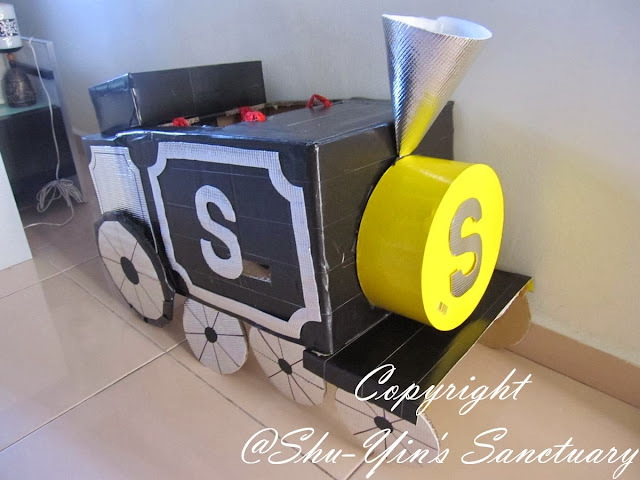 But nvm lah, since this train won't be put on the floor but to be hung on Shern's shoulders. I cut a whole somewhere in the middle for Shern to hold to lessen the weight on his shoulders, just in case. Front view angle so that you can see the front. Ok, so this is how Shern looks like on the day of his Trick or Treats. Shern on his Shern Express. 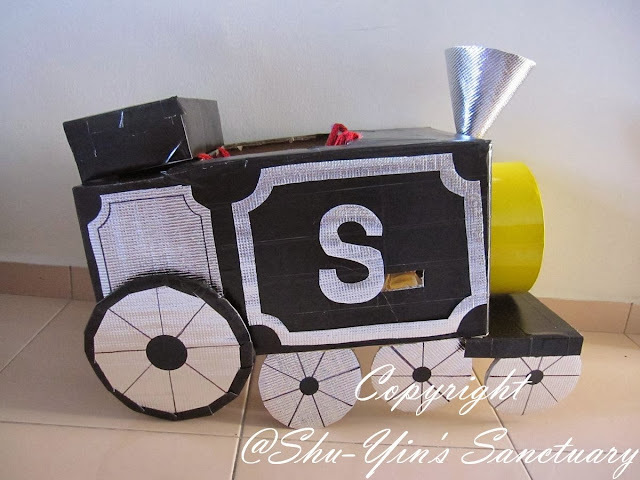 Choo choo Chugga Chugga Choo Choo! Ain't he the cutest train driver? Will talk more on the Halloween Day in the next post. Stay tuned. Love max!! You are so creative!!! Wow! Truly a labour of love... staying up after midnight and redoing the work to get it just perfect. The end result looks great!